Situated attached to our own home built over our garaging area completely private and quiet. Lock up garage Own access. BBQ and outdoor furniture located on large deck below apartment. Bedrooms are at opposite ends of the lounge giving privacy to couples. Quality linen is supplied and beds are made up for your arrival. Pantry will be stocked with basic condiments. Full laundry is located at the bottom of the stairs, shared with owners Mike and Glendyr. Situated only 6kms from Central city, no sulphur fumes! Handy to all toursit attractions. Owners Mike and Glendyr live in the main house on site but will not intrude on your privacy but only to happy to help with any advice etc.. We have a young Golden Retriever and 2 cats but the apartment is kept animal free. Prefered contact is by email - I will answer them so please check your junk mail if you have not received a reply! Tut Glen is a wonderful lakeside apartment with gardens and a pool. We found everything we needed in the well-equipped kitchen and enjoyed a comfortable living area with a large TV. There are two bedrooms, so bring friends! Big windows, rose garden and a delightfully private location. Enjoy the lake!! Located just where it is perfect to all the area offers and the owners were delightful. Idyllic setting by Lake Rotorua. This is an excellent property: lovely setting on the lake (you will want to enjoy kayaking at sunset! ), is private and quiet, but with easy accessibility to town and a range of sites; and has very convenient access to the main highway heading north. The apartment is EXTREMELY well stocked with anything you might need- fans, vacuum, every kitchen appliance or tool you could use, etc. We highly recommend this place!! 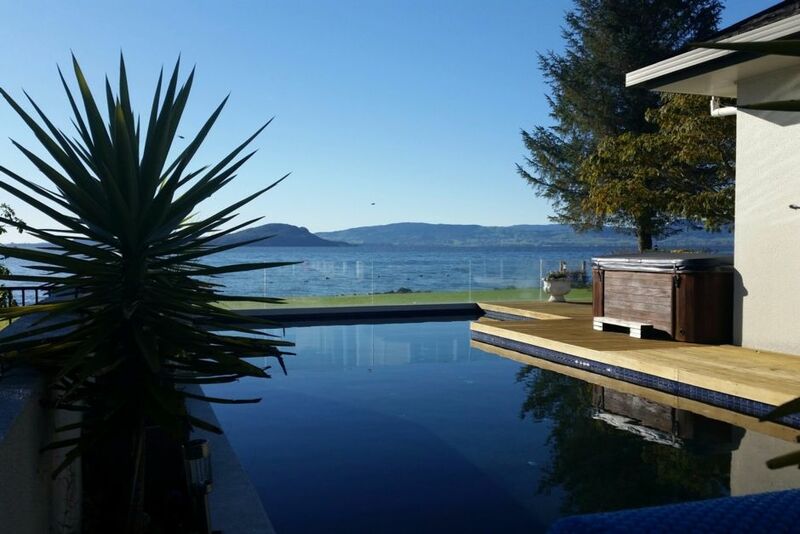 Great location on the lakeside, but no much privacy in the pool or spa from owners house. Tui Glen is a great rental unit. Tui Glen is a great rental unit. It has every modern convenience you need as well as access to jacuzzi, pool and kayaks. The hosts are friendly and are good communicators. We highly recommend this lake front property to one or two couples.